SUMMARY: Dog’s body language in pictures. AUDIENCE: This is more a professional handbook than coffee table material, its style is a little dry and technical. I would not recommend it for the average dog owner. If you are a dog owner looking for a similar book, search for ‘body language’ in this list for other suggestions. REVIEW: I really enjoyed this book: it was a fundamental instrument in my understanding of dogs’ body language. 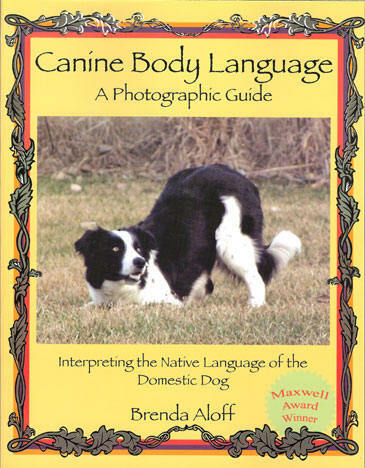 The book is an exhaustive photographic review of canine body language. It teaches you to look out for very subtle signs of stress, fear, unease, aggression, playing, etc. The overarching organization of the book, the framework behind the decision to place individual signs into their respective chapters, is not transparent. This makes it a clumsy tool to use if you want to bring it with you to the field to sharpen your observation skills. Once you have read, re-read and read it some more, your confidence at interpreting, and using dog communication will grow leaps and bounds. You’ll quickly learn to train your eye to recognize the signs. The most important lesson this book has taught me, was to look at the combination of signs to get the full picture. It offers hours of mind-boggling observation games to play at the dog park. In my experience, it takes a lot of practice to finally grasp the patterns hidden in the book, but once you’ve got it, it’s close to life-changing (particularly if you’re thinking of being involved with dogs professionally) as you will uncover a flurry previously undetected signals. In short: The lessons you’ll learn in this book will change your professional life if you work with dogs and want to sharpen your canine body language skills. But don’t expect an overnight epiphany. With this book, you’re in it for the long haul. Every read will uncover a new layer and cement your previous understanding. Browse the Book Review archive. Genre: professional manual. Author: Aloff Brenda. Reading Level: Professional. Star: 4. Bookmark the permalink. Post a comment or leave a trackback: Trackback URL.